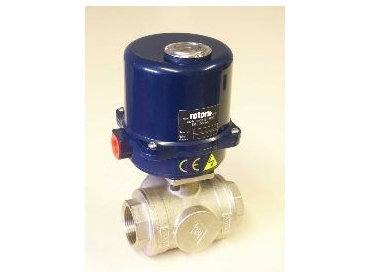 Electric actuators for small valves. Home > Electric actuators for small valves. IP67 watertight enclosure with continuous local position indication as standard. ROTORK Australia has released direct-drive, quarter-turn electric actuators for the motorisation of small ball and butterfly valves, dampers and louvres. The ROM and RBM are designed for directly mounted electric actuation down to valves as small as 12mm. Applications include heating, ventilating and air conditioning equipment, chemical processing plant, food, dairy and drinks production. All models have an IP67 watertight enclosure with continuous local position indication as standard. Options include adjustable torque switches, remote position limit switches, current position transmitter, potentiometer, modulating controller and local control switches. The actuators are available for ac single and three-phase dc operating voltages. They have self-locking and permanently lubricated gear trains for accurate and repeatable performance, offering long term reliability under every day working conditions.